At the end of August, I wrote an article on prepping your hunting site. At the time, our set up had sound logic and a lot of deer sign to make my friend Kyle and I confident in our decisions. Below is the diagram from that article that illustrates where we felt I had the best chance of making a good shot on a deer. As September turned into October and the season began, things just didn't seem right. We were no longer seeing deer tracks or signs that they were anywhere close to the attractant we had placed out in the main shooting lane for my spot. Now we could have let pride get in the way. I mean a lot of work went into making those shooting lanes and knowing the exact distances. Or, we could just listen, because the deer were telling us something. Things had changed and it was our job to figure out what they were trying to say. We regrouped and began to scout our area fresh as if we had never laid eyes on the place before. Wow, the things we discovered! 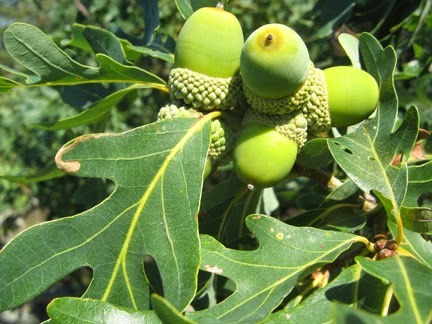 In the diagram above where it is labeled "Forest" were White-Oak Trees with acorns all over the forest floor. There were no tracks at the attractant because the deer were passing on it for one of their favorite foods of the year and under the protection of the forest canopy. "Hey wait, in the diagram there is a big White-Oak right by your stand." Yes, you're right and White-Oaks are known to produce acorns every other year. There wasn't an acorn within 40 yards of that tree. Once in the woods, Kyle discovered a myriad of deer trails that gave us a decent idea where they were coming and going. Several large scrapes were noted also. A scrape is a spot in the dirt that a male deer will paw up and urinate in it to tell all the ladies in the area that he is there. The does will follow suit by also leaving scent in it. It's sort of like a singles bar for deer. One scrape in particular was located on the equivalent to a deer stop light where different trails all connected at this one point - Bingo! It is truly amazing when you pay attention...right? The deer were saying hey Bozos, it is the time of year where love is in the air. It didn't hurt that it also happened to be in conjunction with a buffet dinner of White-Oak acorns. We set up 15 yards from the scrape and the intersection. The very first evening in the blind paid dividends. I thought this was a decent doe, however it turned out to be a button-buck checking the scrape. 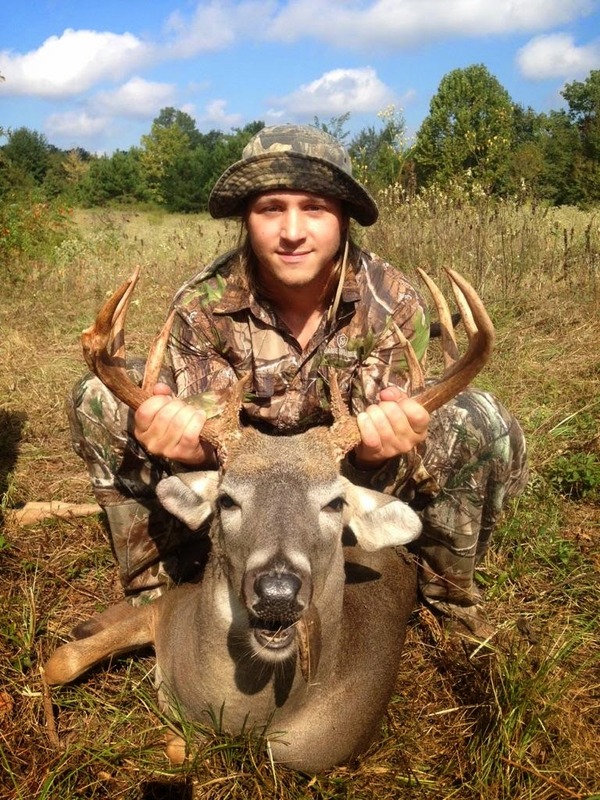 We typically do not like to harvest young bucks but it was simply a case of misidentification. One minute the coast is clear. The next minute you look up and wow, there is a deer right in front of me. Shoot Goofy, SHOOT! The Barnett RC-150 Crossbow performed flawlessly. The Toxic broad-head passed completely through the deer and he was down within a couple of seconds. The wound you see in the picture is the entrance. The exit wound was identical. It looked as if the deer had been shot with a slug. These broad-heads are amazing and allow for a very humane death for the animal. Kyle is a Rage broad-head fan as am I. But, I like a fixed blade broad-head that flies straight and Toxic does just that. Check the video below for other shooting tests using the Toxic broad-heads. Recently I went to an outdoor expo show here in my home-town of Shreveport, LA. In a nutshell, the show was let's say...lacking. I am not exactly sure how booths with dresses get allowed into these things where big burly men who are attempting to look like the entire cast of Duck Dynasty are milling about however, I digress. The highlight of the show for me was meeting Mr. Colin Evans of 556 Tactical. There booth was a shooters dream. There were AR-15's and accessories all over their tables with plenty of people to answer everyone's questions. My brief conversation with Colin that day led to an online interview to give this blog's readers deep insight into the scope and possibilities of what an AR-15 platform can do for you as a disabled or handicapped sportsman. HCO - In your opinion what is the very best AR-15 configuration for a handicapped or disabled person? HCO - Why is the AR-15 platform so good for the handicapped or disabled? Colin - Going back a bit to question 1, we have the ability to really make these rifle platforms more comfortable for the shooter, another unique part of this as well is the ability to change calibers rather quickly. Changing calibers can be as easy as swapping out the complete upper receiver, with another upper receiver in a different caliber allowing some variations i caliber to fit adequately with the game that is being hunted. For example the 300 blackout has been extremely popular for deer, hogs and coyotes. It's a 30 caliber round in a necked down 223/556 casing. This gives much greater knockdown power than that of the 223/556. 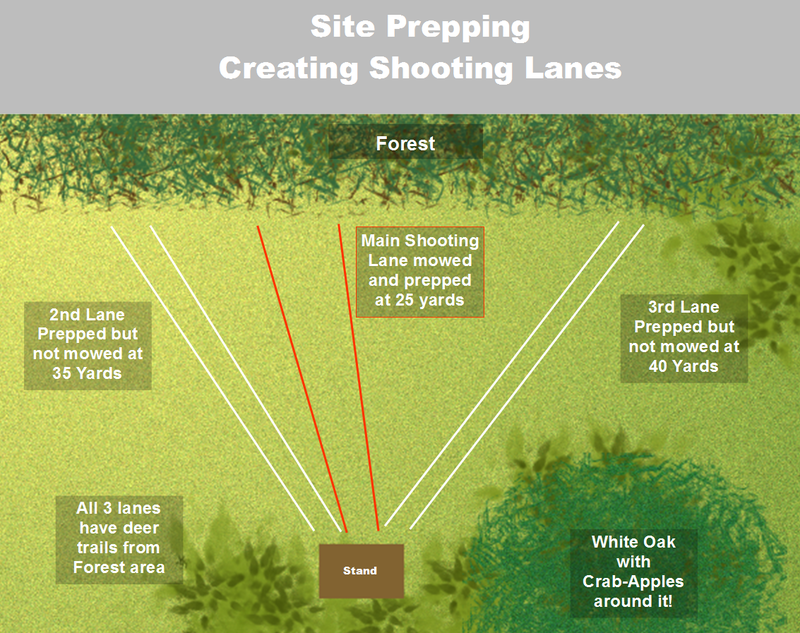 Deer hunting is legal and can be done with a 223/556 but shot placement is crucial for larger game. 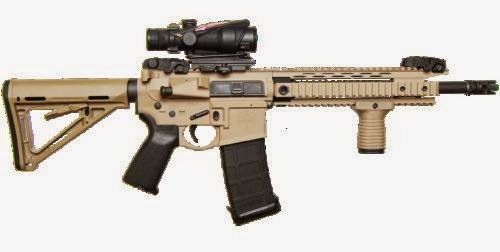 HCO - What non-AR-15 weapons would you recommend as a gun smith for someone who is handicapped or disabled to give them excellent power to cleanly kill a deer while not having their shoulder severally bruised by the recoil? Colin - Really again the shooter has to feel and be very comfortable with any weapon he or she might be hunting or just plinking with. It truly will vary by each persons capabilities and limitations. As far as recoil control there are 2 things that can really assist. The first one is a muzzle brake, a muzzle brake does exactly that like a car slowing down, it's reducing the felt recoil by controlling the gasses as the projectile leaves the barrel. Competition shooters are widely known for using brakes to allow them to have faster follow up shots and stay on target eliminating or greatly reducing recoil and muzzle rise. Keep in mind that a trade off with a muzzle brake is the reduced recoil the flip side of that is the sound is increased dramatically towards the direction of the shooter and those in the immediate area of the shooter. Hearing protection while it always should be a must hunters sometimes tend to slip on that, with a brake, it will only take a hunter one mistake of no ear protection to ever not forget them again. Personally I use electronic ear muffs, they can amplify sounds around you and the moment the firearm is engaged in a target the sound is closed and the shooter does not have his hearing compromised. Second, which was just made legal this year for hunting is a suppressor. While the movies portray these as quiet assassin killing mechanisms it's not quite the case (again it's the movies). Personally I hunt hogs with a suppressor, for two reasons, one is ear protection, with a suppressor I do not have to worry about my head getting rattled and the inner ear ringing from shooting within the confinement a of a deer stand which amplifies sound tremendously, the second is recoil management as it greatly reduces recoil (I use a 308, 6.5 Grendel, 300 blackout or 6.8 spc typically and in AR platform), let me add one more one of my shots is 300 yards from gun to feeder, at that distance with a suppressor the sound is dampened quite a bit and can allow me to take down more than one hog. Impressive information from 556 Tactical and Colin Evans. If you would like to contact them directly, feel free to call them at 318-347-4855 or visit their website. He can help get your custom rig ordered, set-up and tuned to you. Depending on your limitations, making the right calls at the right time can be a difficult task. A sound can prove very powerful to get a deer's attention and move them closer to you for the shot. In my situation, I have lost facial muscles that will not allow me to pucker or purse my lips to make a decent call. Fortunately, technology has made this much easier. Whether your an iPhone or Android user matters not. In both of their stores are many different call makers that you can download for free or pay for. 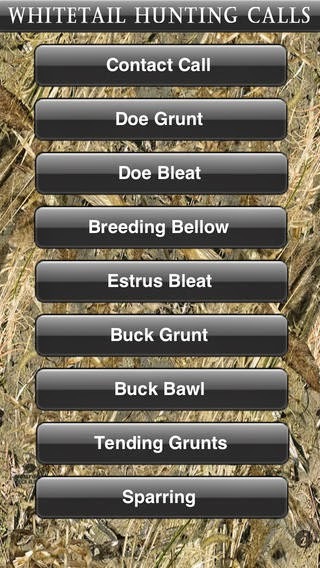 After downloading 4-5 different apps and testing them, I settled on Whitetail Hunting Calls for my Galaxy S3. With the volume turned up, it is loud enough to get the right response. It is also available in iTunes store Click Here. It is a simple and straightforward app to use. Each call is defined and gives you exactly what it says. I would encourage you to either research the best times to use each call or ask someone who is very knowledgeable on the subject. One final note on the subject of calls, make sure that it is legal to use calls in your area. No one wants the uncomfortable visit from Mr. Game-Warden and the very pricey fine that comes along with his presence. This weeks article features a break from the norm which I like from time to time. 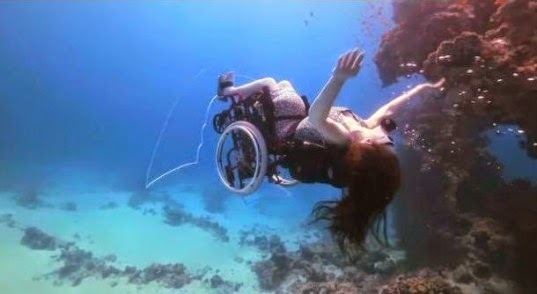 A friend and fan of the Blog shot me a link to this amazing woman who has a self-propelled wheelchair that functions underwater...mind-boggling!!! Welcome to center stage, Sue Austin. She is a performance artist in the United Kingdom and loves to scuba. 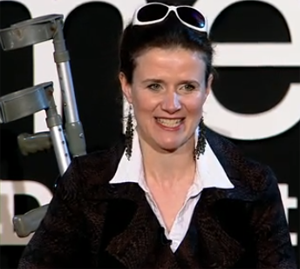 She has created a movement of sorts called "Freewheeling" that is in a word - AWESOME! Refusing to simply accept the label "disabled" she strives to integrate the disabled world with the able-bodied and erode the differences...Bravo! To check out more on her initiative Click Here. Now to the fun stuff. 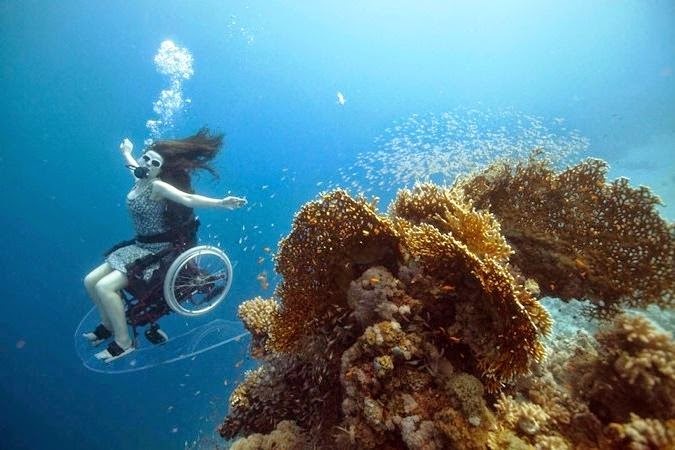 She has taken a basic push chair and paired it with a propulsion system and two large Plexiglas wings which she manipulates with her feet and quite literally flies through the water. Add the scuba tanks and she is off and swimming at her leisure. For years I have dreamed of things like this. I love Cozumel and with 200 feet visibility you do not exactly want to be tethered to someone else. Safety is an issue for me as I could easily wind up in South America or Texas depending on the currents. So, a chair like this would just be amazing. Thanks Sue for not stopping on your passions and for having the guts to advance and overcome. Hopefully in the future we can get the exact specs on the chair out to you guys on how to pick one up. The Word of God says that "As iron sharpens iron, so one man sharpens another." I like the fact that this woman has done something. She didn't sit around and wait for it. She got off her but (pun intended) and made up her mind that she was not willing to give up something she loves. You can tell by the photos that the experience is simply thrilling for her. And she compels all of us to go for it. Whatever is in your heart - chase it! She is sharpening us. The next question is what about you? 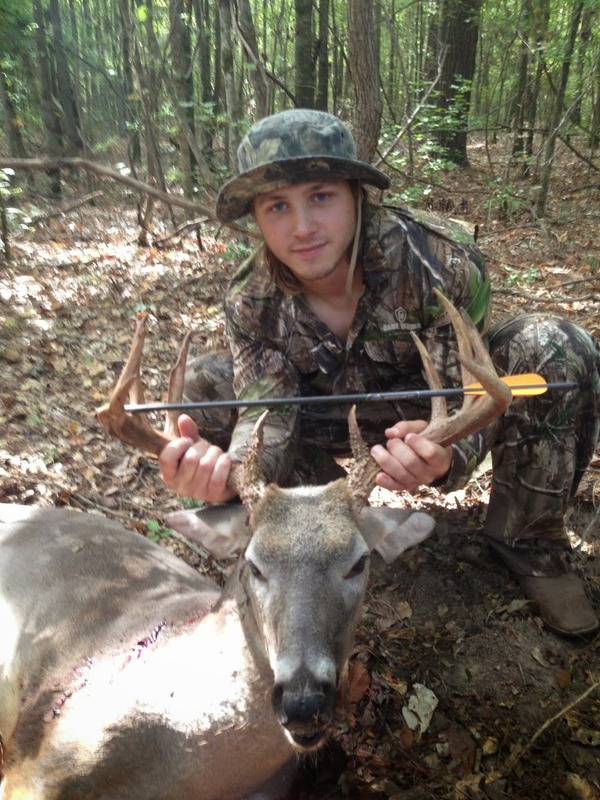 One of my favorite former students bagged a big boy on the first day of bow season using the Barnett RC-150 Crossbow featured in a previous article on this blog. 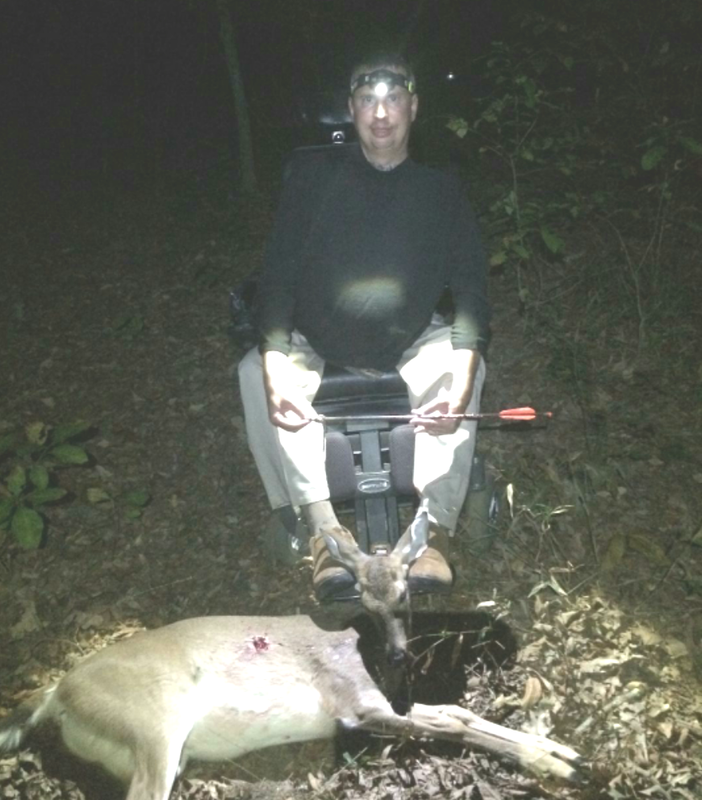 Great job Scotty and wow what a nice buck taken in a very public wildlife management area!